There is evidence that spatial reasoning and mathematics achievement are related in typically developing students (e.g., Mix, K. S., & Cheng, Y. L., Advances in Child Development and Behavior, 42, 197–243, 2012). 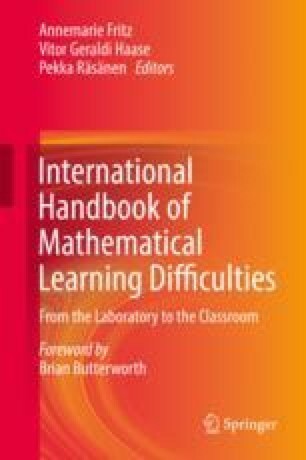 This chapter expands discussion to consider spatial reasoning in children with mathematics learning difficulties (MD). We begin by showing that spatial reasoning and mathematics achievement are multidimensional constructs comprised of dissociable, yet interconnected, skills. In this context, we consider how selected spatial and mathematical tasks intersect and how these connections may differ for students with MD. Spatial reasoning supports understanding numerical magnitude, which is commonly recognized as a core deficit in children with MD. Studies suggests, however, that children with and without MD may have similar spatial skills, with the exception of spatial working memory, where typically developing children have an advantage. These findings raise the possibility that spatial reasoning might be an untapped reservoir of strength for some children with MD. Visual number line activities may be particularly effective for connecting spatial and numerical skills. This work was supported by the National Science Foundation Grant SBE-1041707 which supports the NSF funded Spatial Intelligence and Learning Center.